Since the 1800s, people have traveled up and down California bedding down alongside their pack mules or horses, but not now, especially not in the city or county of San Luis Obispo. While working as a landscaper, 66-year-old John Sears began traveling with his mules across the country about 30 years ago, a common sight in some states such as Montana. After Sears retired at 54, he began spending full time on his hobby. On May 29, San Luis Obispo Police officers arrested Sears after they found him sleeping near the tracks by Woodbridge Street. 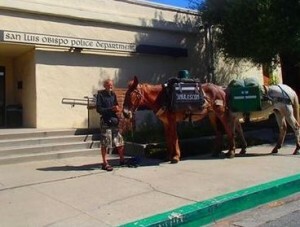 On his Facebook page, Sears says the police also determined his two mules were homeless. “The metropolis says the mules are homeless, they don’t live in one of my city’s shisy (sic) buildings and they don’t go from one building to the next in my glitzy, shiny automobile, they are homeless,” Sears wrote on May 31. Sears, who survives off his meager Social Security income, has a court date on August 14, according to his Facebook page. However, he is attempting to get an extension to November so they he can leave the area and move north were the climate is easier on his mules. In addition, on Saturday at 11 p.m., a San Luis Obispo County Sheriff deputy woke Sears up and ordered him to move along or be cited. We’re so tolerant in this new, progressive age, aren’t we? Ge real. This obnoxious clown is traveling around by mule and tent? Proper food for the mules? Where are the mules supposed to use the bathroom? Proper pastures for the mules to graze? This isn’t the 1800s. And this guy is nuts. I find it ironic that the Tribune deletes every comment I make regarding the homeless (like what would I know about it ?) Than turns around and publishes an unauthorized photo of me in print and online. The photo featured me with Lois Capps who happens to be from my home town: Ladysmith, Wisconsin. I voted for Francisco, by the way. The Tribune does have a prerogative to do so, I get it, but for assumed champions of freedom of the press and speech, there does appear to be a pattern to it. Long day yesterday, Individual I mentioned yesterday posting on YouTube, I am attempting to motivate him to take a “selfie” and publish it in the Tribune so the community can see what success looks like. I think Mr. Sears should be declared: A California Landmark and be left alone. Normally Mr. Sears passes through briefly, but since his movements are being restricted due to these citations his pattern of transmigration becomes increasingly constricted. Those who press upon these freedoms and liberty, I believe will come to feel “crowded” themselves. Two can play these games. I stand corrected in this instance my remarks in the Tribune have not (so far) been deleted, they have been elsewhere. It should perhaps be noted that there is nothing sweet about me, I can be highly expressive; therefor I do attempt to self regulate my freedoms of expression on other peoples cites and blogs for the sake of the children. Feb 23, 2014 – Empty panga boats, thought to have been carrying drugs and people have been discovered along the beaches north of Cambria. What has the Sheriff’s Officers done to capture / arrest those drug runners who enter this country illegally? Oh, I forgot “The Obama” says let them go…but make sure they arrest 66-year-old John Sears and his Mules for sleeping alongside the road. What? “The Obama”? Perhaps Bengazi or WTC or other misinformation. LOL Sheriff Parkensen did not vote for Obama. I vote for the mules for city council. Too many jackasses on the Council already. I wish I had known, he could have stayed with me for a while. Probably would have had some pretty interesting conversation……..
My exact sentiments. He could stay at my house in Atascadero while on his way to Paso Robles. His mules could eat my grass for their keep! If Pete E from SLO is reading this, he might be willing to let the guy stay for a short time with him. Pete?? I’m always ready for a good story telling session and I’m sure he has a bunch of them. I don’t know about Pete but I have a lawn that needs a Mule or two and I could use the fertilizer too. This is, unfortunately, typical of the very Mean City SLO has become. It all started with making it illegal for every little kid to do something little kids have loved doing forever, feeding the ducks. (Where are those ducks today? Remember the flotilla that used to be at Laguna Lake? The city got rid of them. For shame. The tourist ducks downtown have pretty much been eliminated too.) Then they passed a whole lot of laws to make all sorts of normal things illegal. Like where you put your garbage cans. They really thought that one through. 60,000 garbage cans in town, and the city’s going to pay attention to every single one of them. Right. So, no sooner they pass that doozey than the newspaper prints that Marx herself was in violation. Seems like she really thought that through before voting for it. They’ve got a whole lot of other nasty laws that they enforce when they feel like it, against whom they feel like it, but not against everybody. Mean City is the reality. Happy Town is public relations for those who have no clue what’s up, and haven’t yet been arrested. “Happy Town” is a myth of Oprah and anonymous other jaded phonies that make millions from advertising. It’s all a game….a carny rigged game to dupe the ‘marks’.